Very Very Vicky: Window Shopping aka Shopping With Windows! I am a good shopper...at least a good window shopper. Back in the day when we were all young new homeowners, friends would call me to tell me what they needed and ask what I had seen. I usually would have some good leads for them to follow and could narrow down the selections by store, style and price. Now I window shop on my computer screen--maybe I should call it shopping with Windows! I like it because you can find more options with less trouble and then once you've made your choice, you can find the best price and possibly an online coupon! Even better--your purchases are delivered to your home and often with free shipping! Can you tell I like a bargain? Flash sale companies have become very popular--you know, companies that send you emails about discounted products that will be available for a very short time. You can find some great deals but you have to be careful that you don't buy something just because it's a great deal--it's easy to get caught up in the excitement of a bargain and buy something you regret. 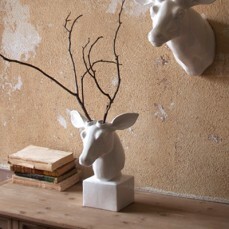 Ceramic deer head with holes for antlers--available for desk top or to hang on the wall--you supply the twigs for antlers! It's quirky but attractive and I could see myself using it at Christmastime in our cottage or even at my primary residence to lighten up a more formal mood. These cups also caught my fancy! 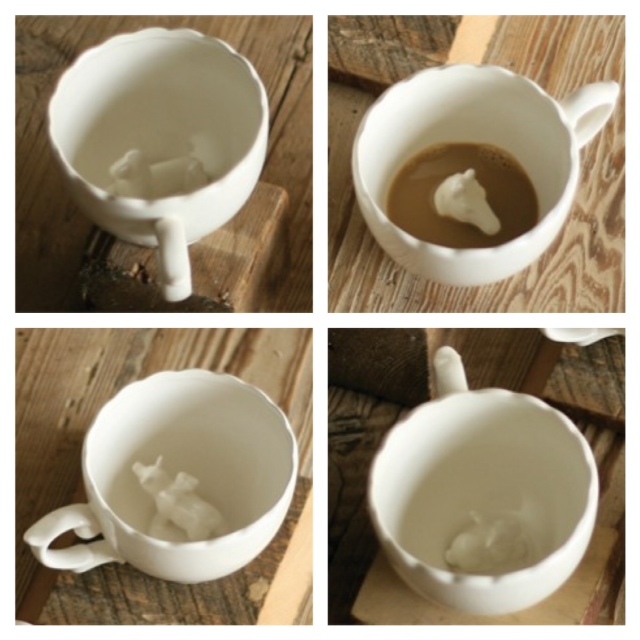 I could just imagine how much fun they would be to use with my grandchildren...if they drank all their milk they would get to the dog, horse, pig, or rabbit in the bottom of their cup! 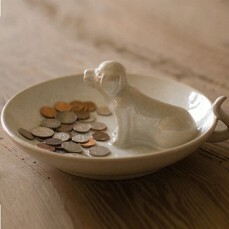 Gives new meaning to "dog bowl"--great idea for the spot where someone empties their pockets or leaves the spare keys to the car. 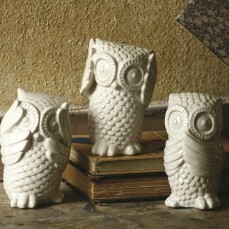 Cute twist on the traditional monkeys doing "see no evil, hear no evil, speak no evil". Antique Farmhouse leaves the sales open for 2-3 days. If you think you might enjoy shopping for cottage-y goodies that you haven't seen anywhere else, then have a look! This link will take you to an invitation to join! Happy window shopping! You find the best things! You have a great eye & you can tell you have fun!